A unique design that sets a new standard for ribbon mics, at a price that reflects its quality. Extended frequency range. Smooth ribbon sound with great transient response. High quality engineering. Expensive. Complements rather than replaces other mics. The recent partnership of sE and Rupert Neve has created a new range of high spec microphones of which the RNR1 ribbon mic is the first to be released. With Siwei Zou and the sE team taking care of the physical design, Rupert Neve has created the discrete op amp and two custom hand-wound transformers that redress the HF roll-off of the ribbon element, extend the lower frequency response and reduce the inevitable increase in the noise floor caused by the flattening of the response curve. The result is a ribbon mic that is phantom powered with a remarkably flat response from 20Hz to 25kHz. The RNR1 comes in a handsome wooden box which slots into the flight case with a top quality suspension mount and manual. The mic is tall and well-built so a strong stand is necessary, especially for boom operation. This weight is a mark of quality - powerful magnets, good casing (RF protection) and two transformers should never result in low mass. Alongside a selection of our favourite ribbons and condensers we started testing the RNR1 with an acoustic guitar. While the other mics all had a 'sound' or interpretation of the guitar, for better and worse, the RNR1 sounded like nothing, but in a good way. It sounded distinctly natural, highlighting the good and bad qualities simultaneously as well as those of the room around it. This response is consistent across all sources: drums, electric guitar, bass guitar, voice, harmonium and upright piano. The mid-range has the classic smoothness and clarity for which ribbon mics are renowned. Though the RNR1 is designed to have the wide range response of condenser mics it does not display the associated upper-mid hype and this gives it a strong sense of acoustic realism. The low-mid response translates complex and close resonances in this critical band with a separation we have never heard before. "The RNR1 sounds distinctly natural, highlighting the good and bad qualities of a guitar simultaneously as well as those of the room around it." Where this mic stands out is at the extremes of the frequency spectrum, which is where the input of Rupert Neve becomes apparent. We have ribbon mics that we favour for LF work, but the RNR1 just seems to go down an extra octave to produce some of the most glorious lows we've ever encountered. At the other end of the spectrum the same extension and transient response occurs with a smooth and accurate response that never blurs complex harmonic interrelationships. It also allows the airy realism of a source and its acoustic space to come through without hype or harshness. This is a pleasingly sensitive mic and is ideal for uses where the translation of the acoustic space is important. The low noise floor of the RNR1 coupled with the extended HF response means it works well on very quiet sources. Considering what sE has set out to achieve the RNR1 is a resounding success. 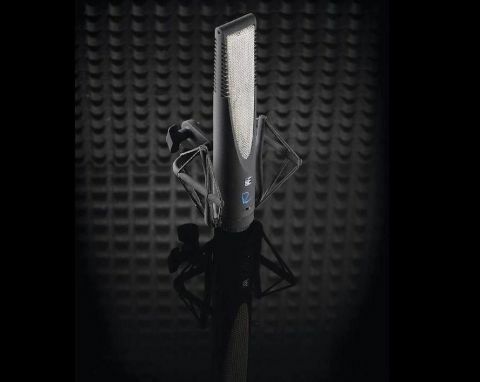 It sets a new benchmark for ribbon mic performance and active microphone circuitry. Bespoke transformers, high build quality and extensive research come at a price, though, which in this case is just over £2,000. If you can afford it and you've already got a well-stocked mic cupboard then the RNR1 would be a worthy and unique addition. We would always recommend saving for one great piece of equipment rather than lots of half-hearted gear, and this is worth saving for if you regularly record acoustic instruments and have access to good acoustic spaces.